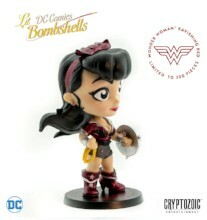 Ravishing Red Wonder Woman is a variant of the regular DC Lil Bombshells vinyl figure, part of Cryptozoic’s retro-style collectibles line featuring DC’s favorite female characters. 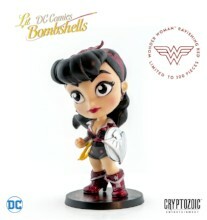 This version of the figure sports metallic red paint on the character’s costume (including her headband) as a nod to Wonder Woman’s appearance in the acclaimed comic book mini-series Superman: Red Son. Each figure is stamped with the Wonder Woman logo on the base and is individually numbered (from 1 to 300) on the bottom. 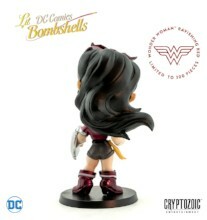 Designed by Pedro Astudillo and sculpted by Sam Greenwell, the 2.75-inch collectible comes packaged in Cryptozoic’s signature, collectible tin with a foil sticker that includes the Wonder Woman logo. We will have an additional supply of Ravishing Red Wonder Woman figures for purchase at our booth while supplies last. Any Ravishing Red Wonder Woman vinyl figures not sold or picked up during San Diego Comic-Con 2018 will be available for sale on our eStore after the event. Will this make it on your shelves? Let us know in the comment section below. Also, don’t forget to Like, Share and Subscribe to all things Constant Collectible so YOU can keep up to date with all the news and reviews from a world of GEEK CULTURE.